Blog • PSPOs • Take action! Victory for sheep commoners in the Forest of Dean! 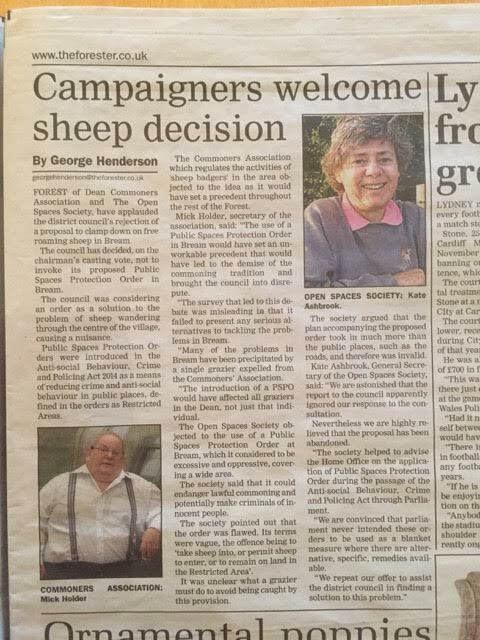 We have posted before on Forest Dean Council’s attempt to ban sheep from the village of Bream. The ban would have threatened traditional sheep-grazing practices and the long-standing practice of sheep commoning. There is good news: the PSPO was defeated, in a tight and heated council vote. The council committee was evenly split on the issue (19:19), and the chair decided the matter by voting against the PSPO. This is wonderful news – a rare case of a PSPO being defeated in council committee. It shows the importance of PSPOs passing through local democracy, and being subject to debate and argument at a local and national level. We must praise the hard work and persistence of the Forest of Dean sheep Commoners Association, with whom we have been delighted to work (see a letter from them after the deciding vote). See coverage of the decision in the local newspaper.